We’re thankful for these two little guys and especially, lately, for Sam, who just turned 1 year old on October 30! This year has been filled with traveling, adjustment, and craziness, and we are thankful for this little guy, who generally has a smile on his face, except in the video above. God has really blessed us with two precious little boys. We would continue to covet your prayers for them. It seems like every two weeks one of them is picking up a little bug of some kind or another. We’ll send out some more information soon – there’s actually a lot going on! Thanks so much for your prayers and support! Hi, everyone! Well, June is almost over, and this is our first blog of the month! June has really gotten away from us as we get ready to head back to the USA and Canada for the month of July. We both, and especially Kristin, have been busy chasing a three year old around and an almost eight month old, teething baby around. I (Derek) have been busy with normal ministry things related to the CROSS Project HIV/AIDS Ministry and ACTION Zambia Administration and also getting ready for the ACTION International Council meetings (July 6-9) near Calgary, Canada with reading and writing things. Along those lines, we want to thank everyone who gave and prayed for the $5,000 we needed to cover our time at the ACTION International Council Meetings and the 40th Jubilee Celebrations for ACTION! God has been so gracious to us, and all of the money has come in! Thank you so much for your gifts and prayers, and we praise God for all of you!! 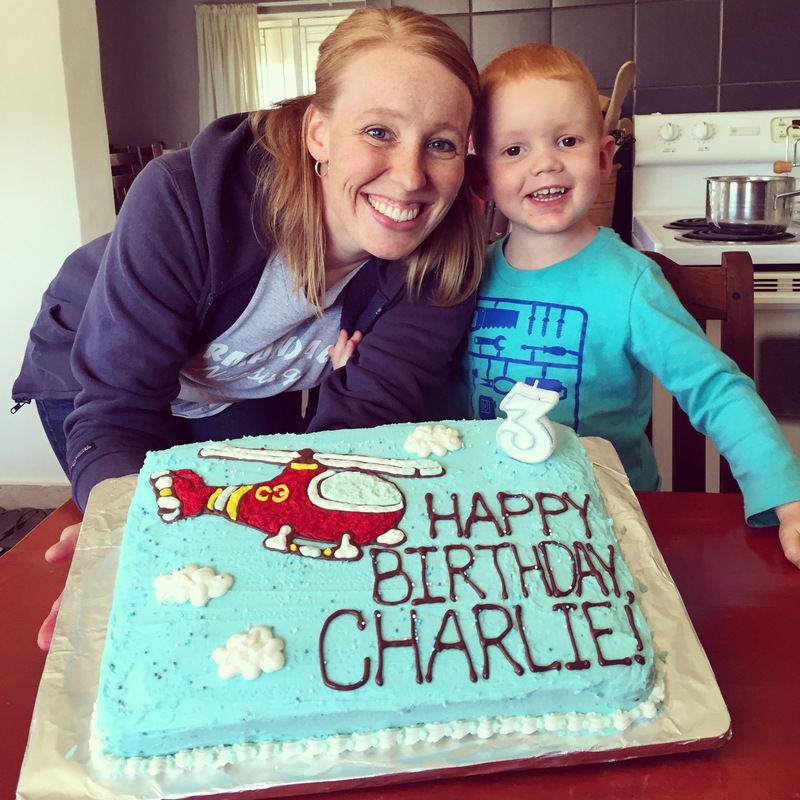 -We praise God for Charlie, who turned three years old on June 15th! He is such a happy, funny, very thoughtful, questioning, and inquisitive three year old. We love him so much and are so thankful for him. -We praise God for Jason and Grace Van Ankum, who will be joining AZ this July. They are originally from Canada and have been living in Zambia for almost a year working with another Christian organization up in Ndola. But now their transfer is complete, and they will be helping out in our Pastoral Leadership Development department with ACTION Pastor’s College. They also will be staying in our house while we are gone in North America, which is a huge help to us! -Please pray for us as we travel this Monday (40 hours total on June 29 and June 30!!) to Minneapolis via Johannesburg, London, and Chicago. Pray for Charlie and Sam that they will both do really, really well with all the waiting, sitting, and long plane rides. Please also pray for safety and that we make all of our connections. -Please pray for our time up in Canada. The International Council Meetings will be taking place July 6-9, and the Jubilee Celebrations will be taking place July 9-15, both at the same location – Prairie Bible College. We are very thankful for ACTION and the work that God has done through ACTION for His glory for these past 40 years! -Please pray for the electricity situation going on in Zambia right now. Because of the low rainfall this past year and because 93% of Zambia’s electricity comes from hydroelectric power, Zambia’s power company can’t generate enough power for the country. So, we are now experiencing at least 5-6 hours a day of load-shedding, which is another way of saying that the power company turns the power off for 5-6 hours a day. We’ll be gone the month of July and get a reprieve from the frustration, but please pray for the rest of our team here on the ground as they deal with this problem that won’t get sorted out till after the rains start again in November or beyond, unless electricity starts getting imported. Tagged ACTION Zambia Administration, the ACTION International Council meetings, Traveling on Monday! In June, we’ll make sure we post more about how ministry is going and our upcoming trip back to the USA and Canada for the month of July.